Go from scuba diver to the Advanced levels of a PADI Dive Pro. PADI Divemaster internship GoPro 2 is the ideal package for people like you that want to give a total change to their lifestyle! 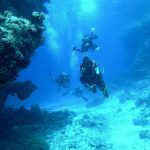 If you have not yet gained a PADI Open Water Scuba Diving certification, and are really pushed for time, then this option is perfect for you. The PADI Divemaster GoPro 2 package has been created to give you all the theory and certifications to get you o n the first level of PADI Pro. During your time with us you will log in excess of 60 dives, which are, all included in the price. You will start with the recreational scuba diving courses that will take you from the world’s most renowned entry level, PADI Open Water, to the PADI Advanced Open Water. Where you will experience diving in different conditions and using some special gear, then on to the Emergency First Response course where you will learn basic Resuscitation and First Aid Techniques, to the PADI Rescue Diver level where you will learn how to prevent and solve problems in the water. The second step will be entering the Professional level of diver Education. You’ll start with the PADI Divemaster course where you will learn to guide experienced divers during the exploration of the underwater world here in Tenerife, and also to assist student divers in training under the supervision of a diving instructor. During the PADI Divemaster program you will learn a lot more about the Dive Theory which will cover subjects like; Physic, Physiology, Equipment, Use of the RDP Table version and the ERDP, General Skills. Don’t worry if this seems a little daunting as our PADI Instructor’s will be on hand every step of the way to assist you. During the practical applications you will perfect your diving demonstration skills so you’ll be able to demonstrate skills to inexperienced divers and students. Once you become a PADI Divemaster, our program will allow you to get some experience and log lots of dives in Tenerife. Also giving you that hand’s on experience that will guarantee you the proper understanding of the duties and responsibilities involved in being a PADI Divemaster. All your required PADI manuals and training materials. FREE loan of all Scuba Diving equipment for the entire duration you are with us.